Ican’t wait for tomato season. It seems like such a long wait. Last week when I was at the farmer’s market, a few sparse green house tomatoes were strewn on farmers’ fold-out tables, but nothing like the ruby beauties we’ll see this August. And red tomatoes are just the start. Ever heard of the Cherokee Purple tomato? 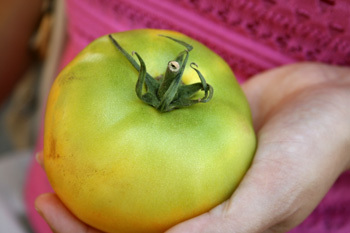 Sometimes called the “black” tomato, it can actually look black and blue when fully ripened. I had one last summer, hand delivered, a gift from Noah, the horticulturalist. And to think some girls crave diamonds? The Cherokee is hands down the sweetest tomato I have ever tasted, with its deep purple blush and faint streaks of rose and green. Speaking of green, I spotted some lovely unripe green soon-to-be yellow tomatoes. Ump, they were hard as rocks. Ah well, fried green tomatoes for dinner it is! Sometimes food, like romance is about anticipation. Impatience led me to try fried green tomatoes two summers ago and now it has become part of my seasonal cooking repertoire. Raised in the North, some Southern dishes didn’t initially make my mouth water. However, the longer I cook, the more curious I become, the more I’ve fallen in love with some traditional Southern foods. What’s so great about fried green tomatoes? Green tomatoes have more nutrition than you think. One cup has only 41 calories plus you’re getting 70% of your daily intake for vitamin C.
A corn meal crust, sprinkle of salt and a little olive oil is all it takes. Something happens to the bitter flesh of a hard green tomato when you cook it. Yes, in that first bite, you’ll taste the gentle teasing acidity and something refreshing too. Could it be that some sugars come forward in the flavor after the tomato comes in contact with the heat? Sounds like a question for Harold McGee. My favorite part of the fried green tomato is around the seeds, it’s so savory! I could make a meal from these, topped off with a chopped salad and some low-fat buttermilk dressing on the side. As I passed the tomato to the cashier, I wondered what it must be like for people who have never tasted a real, naturally ripened, homegrown tomato. I can’t even imagine one summer without them. Can you believe that just a few hundred years ago, they used to believe the tomatoes were poisonous? They are part of the nightshade family of plants, some of which are in fact poisonous. Now they are reputed to be aphrodisiacs. Meow! Formerly called pomme d’amour, or apples of love you can understand why everyone is in love with the savory sweet tomato. Let’s face it, they are a staple in the American diet. In fact their flavor takes center stage in most meals Americans love, from spaghetti and meatballs to meatloaf and fries with ketchup. So tonight, I’ll enjoy my green tomatoes even though I know they do not have lycopene that is produced in the red pigment as the tomato ripens. Oh well, green tomatoes are a pleasing sign. This is just the beginning of summer’s bounty. Ever wonder what the most flavorful part of the tomato is? Read this post about new findings on tomatoes from Harold McGee. Read more about powerful antioxidants in tomatoes (from WebMD). Anyway, please keep putting recipes up! I am almost at the end of the ones that are up so far!!!! Will you share the recipe? I’ve never made them, but my mom loves them and I’m trying to get her to eat healthier. A healthy recipe for these would be perfect! Thanks! I make these babies without using the high fat buttermilk version. For a healthy version, I simply brush them with skim milk, dip them in a mixture of 1/2 flour, 1/2 seasoned breadcrumbs and fry in olive oil. They are wonderful!! !